US, 1991, 186 minutes, Colour. Tom Berenger, Aidan Quinn, John Lithgow, Daryl Hannah, Kathy Bates, Tom Waits. 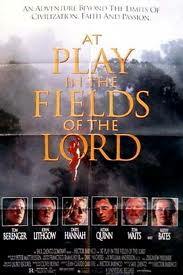 At Play in the Fields of the Lord is based on the 1965 novel about the Amazon, Indian Culture and Religion, the Environment, by Peter Matthiessen. It has been adapted for the screen by Jean- Claude Carriere (screenwriter for many of Luis Bunuel’s films) and the director Hector Babenco. It is a long film, 3 hours' length, offering a range of characters as well as a glimpse of life in the Amazon jungles. Babenco directed the celebrated film of the Latin- American slums, Pixote. He also directed Kiss of the Spider Woman and Ironweed. The film has a strong cast, Tom Berenger giving an interesting performance as the half-Cheyenne mercenary who immerses himself in the life of the Amazon Indians. There is an excellent performance by Aidan Quinn as a questioning missionary. John Lithgow is, once again, manic as the fundamentalist missionary leader. Darryl Hannah, though attractive, seems rather unlikely as his missionary wife. Tom Waites is a mercenary. Cathy Bates has yet another role as a large woman, tense, suffering nervous breakdown. The film is sympathetic to the Indian tribes, the attacks by all kinds of colonialism, whether capitalist, political, religious. It highlights the role of the missionaries, the traditional Catholic missionaries martyred but with more open minds than the domineering fundamentalists with their American cultural background. The film was shot entirely in Amazonia and has extraordinarily beautiful locations. The film is of interest for those who study cultures. While it may be slow-moving and not always dramatically persuasive, it is an interesting look at South American culture in the '80s and '90s. 1. The celebrated novel, adaptation for the screen, the work of Hector Babenco? Adapted for the '90s? 2. The Amazonian locations, environment, beauty, ruggedness? The musical score? 3. The remote jungle towns, the rivers, the jungle itself, the abandoned missions, the Indian village? 4. The title, Moon quoting it as he leaves for life with the Indians? Its ironies with the missionaries? 5. The perspective for the '90s: colonialism, the heritage of the Spanish and the Portuguese, 20th century Americans and their culture? Religious colonialism, traditional Catholicism, domineering fundamentalists? Presuppositions about religion, Christianity, the culture of the Indians, savagery and primitive style, ownership of land? The future of the Indians? 6. The Indians and their culture, religion? Affinities with North American religion and language? Martin's final insight that the Indians should be left alone? 7. The audience entering the film with Wolf and Moon? Mercenary types, the flight, reaction of the captain, the documents, his hold over them, their being stranded in the town, drinking and women, the clash with the missionaries, the discussions with the captain about bombing the Indians? The flight and its effect? Moon threatening to crash the plane into the waterfall? The effect on both? 8. Moon, his background, working with Wolf, drinking, Indian heritage? The discussions with Martin, offending him? His refusal to fight? His flight over the village, the archer threatening him and his reaction? His decision not to bomb the Indians? The threat to crash the plane? His drinking the hallucinatory drink, his decision to fly away, the radio discussions, going out of contact, parachuting into the village? His being received, his foe Aeore and the hostility? The chief welcoming him? The religious interpretation of his arrival, the god (benign and hostile gods)? The life of the village, laughter, play, the women and the children? His being received, inducted into the tribe, the paint, cutting his hair, painting his hair? His staying, his role of leadership? His marriage, the child? His caution about the whites, the missionaries? Urging the return of the gifts? His visit to the station? The encounter with Andy, the sexual approach? The irony of influenza, its effect on him, on his wife, on the village, the devastation? His blame? Appealing to the missionaries for the medicine? His angers? The confrontation with Aeore, whether he was god or not? Martin and the warning, forcing Martin to pray to him to save the Indians? The helicopter and trying to get the Indians to leave? The final confrontation with Aeore and his shooting him? The canoe drifting off, his painting himself, the last of the tribe? 9. The Indians, their culture and style, their land, their religion? The personalities within the tribe, the warriors, the chief, Aeore, the women, the children? The delight of the children? The greed for the gold, the missions, some of the converts and their motives, the guide and his conversion? Life in the village, the long scenes of the rituals? Religious, communal, meals, banquets, celebrations? The Indians receiving Moon? The killing of the whites, the clash over the attitude to the whites? The final testing of Moon? The helicopter, Martin and his warning, the devastation by the influenza? The scattering and the destruction of the tribe? The irony of the civilised family, their rituals, praying when Billy died? Their fleeing the mission? The guide, civilisation, stealing, his anger with Martin, killing him? Moon not killing him? 10. The Quarrier family? Their enthusiasm, lack of experience? Martin and Hazel as a couple, relationship with Billy? The nice couple from South Dakota? Their arrival, religious sense, fundamentalist? Martin and his sociological interests, language, customs, documents, photographs? The meeting with the Hubans? Praying together? The bar, the argument with Moon and his anger? Hazel and her reaction to the filth, trying to keep Billy Clean? Billy as a young boy, eagerness, relationship with each parent? The danger with the mission, the decision to go, the long voyage, learning? Language? Martin and his delight, settling, putting out the gifts? His continually questioning attitudes? His religious beliefs and convictions, rational? Yet the prejudices? Hazel and her prim manner, unwilling to be in the mission, her sense of duty, her shifting moods? The assumptions about the Indians, her reaction to sexual behaviour, to Billy playing with the children? Continually hostile, dressing the Indian women in dresses and bras? Her continued fears? The contrast with Billy playing freely with the children, taking off his clothes, being painted, sharing their lives? 11. The missionaries and the Indians, the convert family and their support? Wanting the wild Indians to come, the gifts, the encounter, Hazel's fear? Giving them the knife? The gifts returned? Billy's illness, his death? The companionship of the boy, his father's honest talking, his mother's fears? The arrival of Leslie? The burial, Martin and his doubts, grief? Hazel and her grief? Her not leaving and going back into the water and staying with Martin? Her gradually going mad, covering herself with Mud and dancing? Her finally leaving - and her withdrawal from the world, saying "Bye bye"? 12. The portrait of the Hubans, in the town, their convictions, attitudes, prayer, supervision of the missions? Leslie and his deal with the captain? Andy and her American style, her faith? The voyage, helping with the setting up of the mission? Andy and her clashes with Hazel, Hazel's jealousy? Her swim, the encounter with Moon, the sexual awakening and her reactions, explaining it with Martin? The flu and her communicating it to Moon? Leslie and his dominance, his bigotry, the anti-Catholic bigotry? The radio contact, the communication with Martin? Billy's death? His fears, his cut hands, the barbed wire enclosure? The deal with the captain and Andy's reaction? The news of the disaster and his final letter to the missionary superiors? 13. Wolf, the mercenary, disregard for people, Jewish background, his innate bigotry? 14. Missionaries, Catholics, the past, the martyrs? The priest and his church, continually welcoming, respect for the Indians, his doubts about the value of the mission work, his views on God's openness? His praying at the tomb, Leslie's reaction? Helping Andy and the hymn in the church? His warning to save the Indians? 15. Fundamentalist missionaries, the lack of training, the imposition of American culture, creature comforts - the record player and the couples dancing? The books, photography? The anti-Catholic stances? 16. Billy, the possibility of Indians and whites together, games and play, the bonds - yet his death? 17. A portrait of the Amazon area, the intrusions of colonial powers, the destruction of Indian culture, western diseases and the destruction of the Indians? Future?